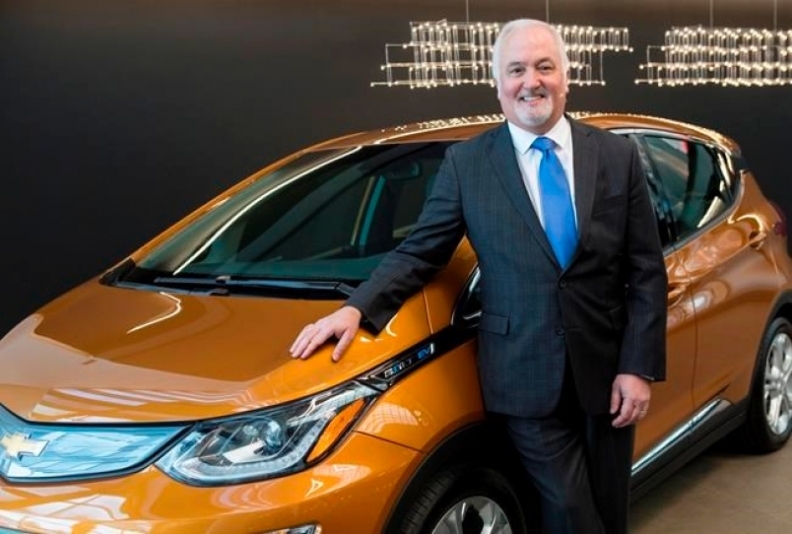 General Motors Canda President Steve Carlisle stands with a Chevrolet Bolt EV before a news conference to announce the opening of GM's new Canadian Technical Centre, In Markham, Ont., on Jan. 19, 2018. General Motors, seeking a faster turnaround at its flagship luxury brand, appointed Steve Carlisle president of Cadillac, replacing Johan de Nysschen, who will leave the automaker immediately. 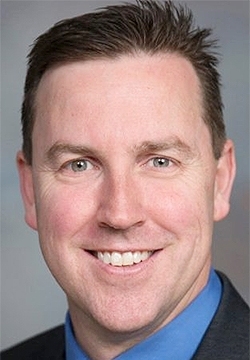 Carlisle, who was also named a senior vice president of GM on Wednesday, is replaced effective immediately by Travis Hester, a 23-year veteran of GM who currently serves as vice president of global product programs at the automaker. De Nysschen, 58, was named head of Cadillac in July 2014. De Nysschen, in an interview Wednesday with Bloomberg News, said he left amicably and declined to go into details on what prompted his departure. The abrupt change, according to two people familiar with the decision, was a result of de Nysschen’s reluctance to accelerate product and operating plans and capitalize on current U.S. market conditions, where industry sales remain healthy. GM executives, the sources said, acknowledge that it takes time to rebuild a brand but there needs to be more commitment to the here and now, rather than the future. De Nysschen’s tenure as head of Cadillac was controversial among American dealers, who had raised concerns about Project Pinnacle, a program aimed at boosting dealer performance. Project Pinnacle launched in April 2017, and de Nysschen had signaled a willingness to alter the program after many dealers missed targets last year, a welcome sign to many dealers who attended the brand’s annual make meeting in Las Vegas in March. De Nysschen, who had previous stops at Audi and Infiniti, also oversaw the brand headquarters’ move from Detroit to Manhattan and the launches of Cadillac’s SuperCruise system and the XT4, Cadillac’s first compact crossover. He also made a major push into China, where its 2017 sales surged 51 percent from a year earlier. De Nysschen has said Cadillac was on pace to sell more than 200,000 vehicles in China in 2018. Carlisle took the helm of GM Canada on Nov. 20, 2014. Under Carlisle, GM Canada sales grew to 302,826 vehicles in 2017, up 21.2 per cent from the 249,800 units sold during 2015, his first full year as president of GM Canada. 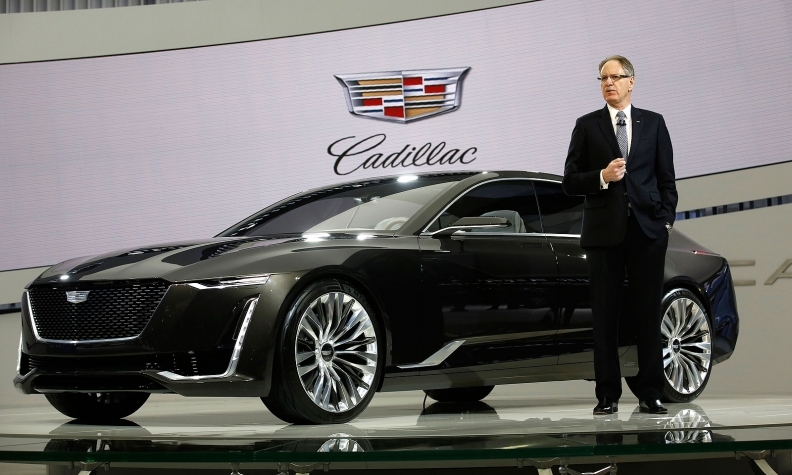 Carlisle, 55, will be at least the fifth head of Cadillac since GM’s emergence from bankruptcy in July 2009. Carlisle, who will report to Ammann in his new role, takes over a brand that has seen its U.S. sales decline in recent years. According to the Automotive News Data Center in Detroit, Cadillac sold 156,440 vehicles in 2017, a year-over-year decline of eight per cent. Year-to-date sales in 2018 through March were up 8.1 per cent to 36,727 units. Carlisle, born in Woodstock, Ont., got his start with GM in 1982 as an industrial engineering co-op student at the now defunct Oshawa Truck Assembly Plant in Ontario. Before taking over as head of GM Canada, Carlisle held positions in the United States as head of U.S. sales operations in 2010, president of GM’s southeast Asia operations from 2007-10 and as vice president of global product planning from 2010-14. As head of GM Canada, Carlisle led the automaker through two labour negotiations with the Canadian union Unifor. The first, in 2016, ultimately led to a new contract with most GM Canada workers and, eventually, a $500 million retooling of the Oshawa, Ont., plant, which now does final assembly of Chevrolet Silverado and GMC Sierra pickup trucks on one of its lines. The second round of negotiations, in 2017, was contentious, ultimately leading to a month-long strike at GM’s CAMI plant in Ingersoll, Ont., which builds the top-selling Chevrolet Equinox. GM threatened to close the CAMI plant and shift output to Mexico before reaching a deal with Unifor days later. Carlisle is succeeded by Hester, who has served as head of GM’s Global Product Program since 2016. According to GM, he began his career with the company in 1995 in Australia, where he served in a variety of roles with the company until 2005. Between then and 2016, he held a variety of engineering posts in the United States and China, including as chief engineer for vehicles including the Cadillac CT6, Buick Regal and Chevrolet Sonic. Hester will report to GM North America President Alan Batey. Carlisle is in New York today to do the same. He said the two will work together in the coming weeks as they transition into their new roles. “I think the message today was that Steve is a change agent to help accelerate that Cadillac global plan,” Paterson said. He said Hester, 46, will develop his goals and plans for GM Canada in the coming weeks as he learns more about the unit. He said he anticipates Hester's deep knowledge of GM products will help him connect with dealers and build up the automaker’s Canadian sales. “This is a chance to build the momentum that we have and to expand out his experience in Canada,” Paterson said. De Nysschen became president of Cadillac in August 2014 after stints as CEO of Nissan Motor Co.'s Infiniti brand and head of Audi's U.S. business. He was given unprecedented freedom over managing Cadillac, including moving the venerable luxury brand's headquarters out of Detroit to New York City and operating separately from GM’s core brands. It’s unclear how the leadership change will impact Cadillac’s future product plans and Project Pinnacle, a contentious and ambitious program spearheaded by de Nysschen to overhaul the brand and its retailers. The long-term Project Pinnacle program has drawn the ire of U.S. dealers and yielded little results on the sales front, as Cadillac's sedan-heavy lineup has largely struggled in a market shifting to light trucks, notably crossovers. De Nysschen, according to two people familiar with the situation, also recently drew criticism from company executives for publicly calling Apple Inc.’s CarPlay system “extremely clunky” -- creating tension between the tech giant and automaker.